Sometimes lost in the shuffle of a tight divisional race and the high-profile, injury-related absences of Brandon Morrow, Yu Darvish, and Kris Bryant is Drew Smyly’s eventual return to the mound. If you recall, the Cubs signed Smyly to a two-year, $10M deal last winter, knowing full-well he’d likely need the entire first year of his deal to recover from Tommy John surgery. However, there was always a chance (one that seemed to increase in likelihood at every check-in) that he could appear in the big leagues as soon as late August of this season as a member of the bullpen down the stretch. Well, last time I checked, we’re nearly at the middle of August. So … how are things going? Smyly said he's absolutely planning on being back still in 2018 and ready for any role Cubs would ask of him. But he still has some steps to take to get back into game shape and on the mound pitching in September. So, then, Drew Smyly still expects to pitch for the Cubs *this season* and is doing well in his journey back to the mound. There has, however, been some non-Tommy-John-surgery related muscle soreness that’s slowing the process down, and he’ll continue to build up strength, with a target of September in mind. And for what it’s worth, Jesse Rogers adds that the *specific* goal for Smyly at the moment is reducing the recovery time between throwing. Alright, that’s not too bad, right? Actually, that’s pretty good. A little muscle soreness after not pitching competitively for 14 months is perfectly understandable and there is no reason to believe there’s any kind of elbow issue. As far as not making it back this August, well, that’s not too big of a problem either, right? Heck, given the roster considerations, that may have always made the most sense anyway. 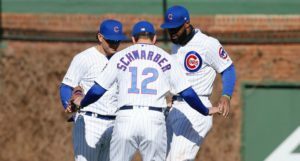 As of today, the Cubs bullpen is quite full, despite the potential for either of Brandon Morrow (DL) or Anthony Bass (Iowa) to return sometime in the next two weeks. Sure, Tyler Chatwood doesn’t really belong in the bullpen and no one is married to Jorge De La Rosa, but all the same, using the expanded September rosters as a reason to give Smyly more time to return is perfectly acceptable. 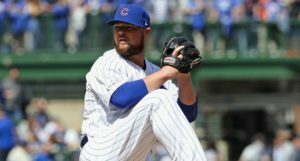 And what’s nice is that when he does return in September, the Cubs will be able to use an even bigger bullpen to spread out his innings at whatever pace he requires. The only downside to that is potentially missing out on quickly learning whether or not he might actually be a useful bullpen piece on a playoff team, but that’s not exactly the most pressing issue. So for today, the news is perfectly fine on the Smyly front. 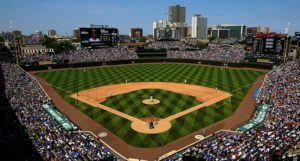 In addition to their closer, ace, and starting third baseman, the Cubs could get yet another bullpen reinforcement in a couple weeks. And who knows? If they’ve built up a big enough lead by then, they may even be able to play it cautiously with everyone, and get each guy ready to contribute in October. Wouldn’t that be something? Can it just work out that way? Pretty please and such?